This is College Physics Answers with Shaun Dychko. Here's an approximation for the acceleration of a rocket given to us by the textbook. 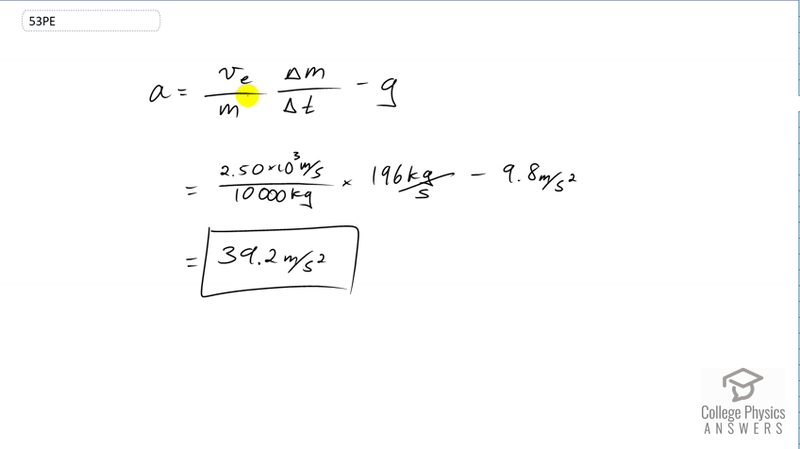 The exhaust velocity is divided by the mass of the rocket, multiplied by the rate at which gas is expelled from the rocket. So, that's the change in the rocket's mass divided by time and then minus acceleration due to gravity. So we're told that the exhaust is ejected at a speed of 2.5 times ten to the three meters per second and the rocket has a mass of 10,000 kilograms and there is 196 kilograms of exhaust expelled every second. So this has units of mass over time and so this single thing substitutes for delta m over delta t. Then minus 9.8 meters per second squared gives us 39.2 meters per second squared is the acceleration of the rocket.